The adage that you are what you eat applies to adults and children alike. It’s true when it comes to the types of foods we eat and the quantities of these foods that we consume. The combination can have a significant effect on health and body weight, for better or worse. Eating lots of fast food and fatty food. Because it’s high in fat, salt, and sugar—and high in calories—a regular diet of fast food essentially gives a child a fast pass to weight gain. The same is true of a high-fat diet. 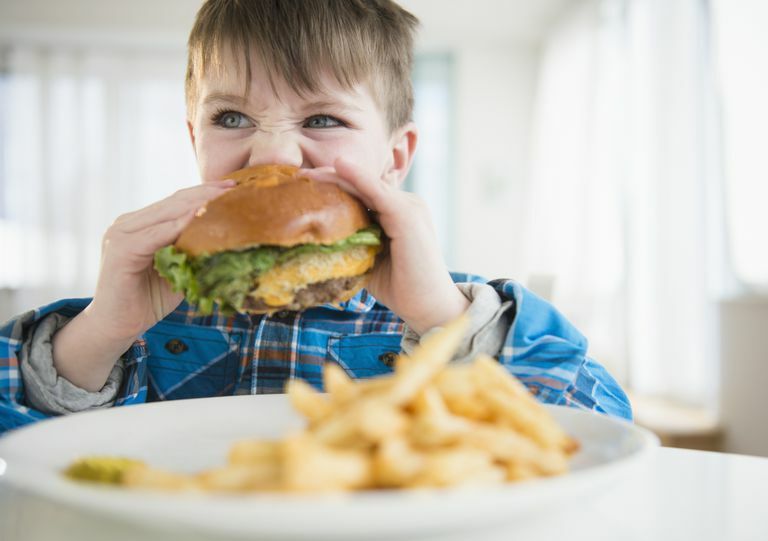 In a study involving 1,203 kids, researchers from the U.K. found that those with the highest fat intake at ages 5 and 7 were 2 ½ to 4 times more likely to become overweight by age 9 than their peers with the lowest fat intake. Serving excessively large portions. Often, when kids are served more, they eat more. In fact, research from Baylor College of Medicine found that doubling the portion sizes of preschoolers’ entrées and snacks over a 24-hour period increased their calorie consumption by 23 percent. These extra calories can quickly add up to excess pounds. Drinking lots of juices and sodas. Sugar-sweetened drinks pack a lot of calories and they don’t fill kids up the way food does. So it’s not surprising that research has found a connection between sugary drink consumption and weight gain. In a 2013 study involving 9,600 children between the ages of 2 and 5, researchers at the University of Virginia School of Medicine found that those who consumed sugar-sweetened beverages regularly at age 5 were 43 percent more likely to be obese than their peers who abstained from sugary drinks. Eating breakfast. Having a morning meal is a healthy way to start the day: It helps fuel young bodies and minds, prevent overeating at lunchtime, and set the tone for better nutrition throughout the day. So it’s no wonder research has found that teens who consume breakfast daily are less likely to be overweight or obese and more likely to be physically active. Consuming lots of plant-based foods. That means fruits, vegetables, legumes, whole grains, nuts, and seeds—foods that are highly nutritious, filling, and relatively low in calories when eaten in the right amounts. In a recent study involving 3,911 children, researchers assessed their body composition at ages 9 and 11 and tracked their eating habits in between. Kids who consumed more high-fiber bread, fruits, and vegetables gained less body fat over the time period than kids whose eating habits included more processed food and soft drinks. Similarly, research from Italy found that kids, ages 2 to 10, with the highest consumption of vegetables and whole grains have a 31 percent lower risk of becoming overweight or obese. Letting kids decide how much to eat. When children are allowed to eat until they’ve had enough, rather than being pressured to clean their plates, it helps them stay in touch with their body’s natural hunger and satiety signals. This can help them avoid a habit of overeating, which can lead to unhealthy weight gain. Having family meals as often as possible. Children and teenagers who consume more meals with their families generally eat healthier foods, which can decrease their risk of becoming overweight or obese or developing eating disorders, research suggests. The hitch is: Healthy foods should be served and a calm environment should be established. Eating fast food as a family or watching TV during the meal can undermine these beneficial effects. DeBoer MD, Scharf RJ, Demmer RT. Sugar-sweetened beverages and weight gain in 2- to 5-year-old children. Pediatrics, September 2013; 132(3): 413-20. Fisher JO, Arreola A, Birch LL, Rolls, BJ. Portion size effects on daily energy intake in low-income Hispanic and African American children and their mothers. American Journal of Clinical Nutrition, December 2007; 86(6): 1709-16. Johnson L, Mander AP, Jones LR, Emmett PM, Jebb SA. Energy-dense, low-fiber, high-fat dietary pattern is associated with increased fatness in childhood. American Journal of Clinical Nutrition, April 2008; 87(4): 846-54. Martin-Biggers J, Spaccarotella K, Berhaupt-Glickstein A, Hongu N, Worobey J, Byrd-Bredbenner C. Come and get it! A discussion of family mealtime literature and factors affecting obesity risk. Advances in Nutrition, May 14, 2014; 5(3): 235-47. Pala V, Lissner L, Hebestreit A, Lanfer A, Sieri S, Siani A, Huybrechts I, Kambek L, Molnar D, Tornaritis M, Moreno L, Ahrens W, Krogh V. Dietary patterns and longitudinal change in body mass in European children: a follow-up study on the IDEFICS multicentre cohort. European Journal of Clinical Nutrition, October 2013; 67(10): 1042-9. Smith AD, Emmett PM, Newby PK, Northstone K. Dietary patterns and changes in body composition in children between 9 and 11 years. Food & Nutrition Research, July 8, 2014; 58.